Taking care of your nails is very necessary, you give your skin special treatments with face masks and cleansers, so why shouldn't your nails be the same. I've recently had some major issues with my nails, but it’s just about resolved now so here’s some tips on how I achieved my healthy nails back. Firstly if you’re like me and paint your nails a different colour every 3 days then you have to give your nails some kind of break or they will start to hate you. Even if you are using a base coat you will start to see that your nails become stained and brittle. I’d say to try to give your nails a break for a few days at least two times a week. Also try to use a strengthening base coat to keep your nails strong underneath the nail polish, I use 17 Nail Xtras Strengthening Base Coat. 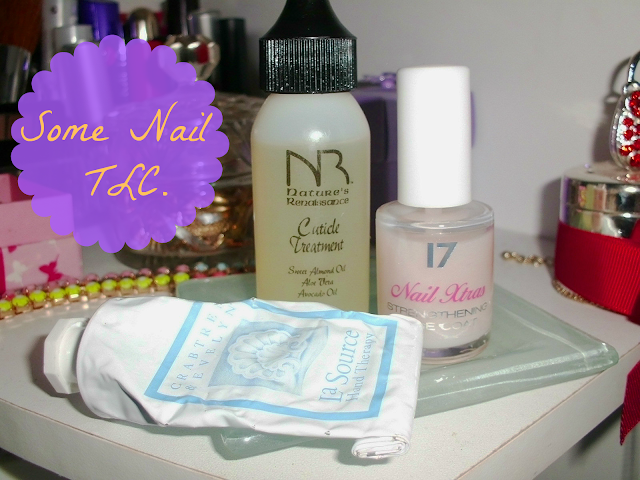 Another thing that you should do is choose a nail polish remover that suits your nails. Most removers are suited to a particular type of nails, such as brittle and dry, or for sensitive and acrylic nails.Using remover too regularly also isn't the best for your nails which is why, again a break from painting them is a good idea. Another great product to have in your nail care routine, is a cuticle oil. I didn't really use this to help my cuticles, just to try and give them some well needed moisture, within about two days they were so smooth and not cracked at all. This was probably the thing that helps my nails the most! I currently use Nature's Renaissance Cuticle Treatment, which my Mum kindly donated to my nails, and unfortunately I can't find it anywhere! But there are cuticle oils everywhere, if you know of any good ones, please let me know! It's not just the nails you need to keep care of but also your hands and around your nails, for this you need a good hand cream. I currently use La Source Hand Therapy- again donated by my Mother-, but as you can see this is running pretty low so I'm going to be either re-purchasing this or finding a new hand cream. One designed for both your hands and nails would be ideal! One last thing is something that I can't actually help you with, my nails were so badly stained it was actually disgusting, I looked like I had been smoking for a hundred years! When I finally did something about it I tried to research how to 'unstain' your nails, the most popular thing I found was a mixture of, lemon, baking soda, olive oil and sugar. But for me this really did not work at all, I just let my nails breathe and after about 3 weeks the orange stain had grown out. It is a pretty long process so keep care of your nails while you can! I will tell you it was such a nightmare having to keep my nails unpainted for at least a month so it is definitely worth trying to give them a break and regular treatments. If there's anything you do to your nails that you would like to share please do! Hope this helps any nail painting addicts out there! Thanks for reading, becciixx.